Join us for the next Galaxy Fitness Session at Samsung 837. After a brief tutorial from a Product Expert, experience the Galaxy Watch Active and learn how it can set goals and track your workout using the Samsung Health app. Then put the Galaxy Watch Active to the test at Swerve Fitness with a team-inspired indoor cycling class. 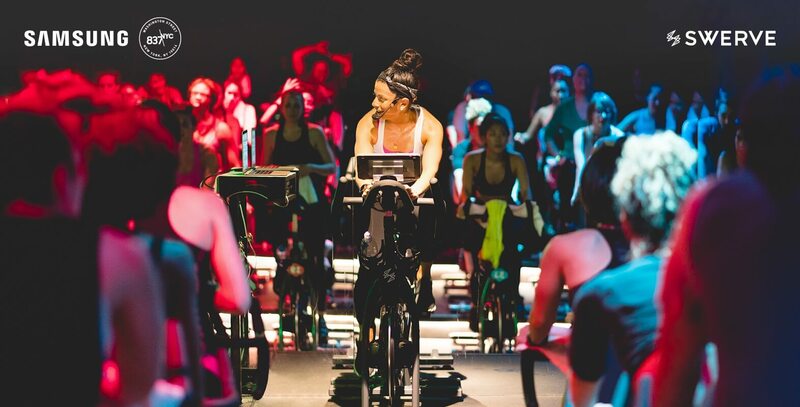 The class is a 45-minute rhythm ride with three teams: Red, Green, and Blue. When you get on your bike, you’ll meet your teammates. Be ready to work your entire body and put your best foot forward. Following the class, the Galaxy Watch Active will review your performance while you cool down and hydrate with a complimentary bottle of CORE™ Hydration. Be ready to test your limits, find your inner strength, and discover technology that will help take your workouts further.